Sometimes the word NIAZ is also used in this context. This is a word from Farsi which means "need," and it is its metaphorical use in the sense of an offering. The basic concept of NAZR is to offer something less valuable in the hope and expectation of receiving something of higher value. The "value" does not have to be material; it could just be honor and dignity. 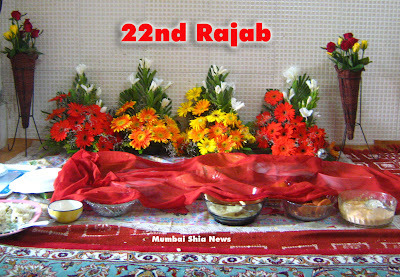 In fact 22nd Rajab (Koonda) is not only a family gathering promoting sila-e-rahem but also social and cultural gathering. The NAZR of the 22nd day of the glorious month of Rajab is done as a result of this love for the holy Ahlul Bayt (a.s.). On this day the sweet dishes like kheer, pudi, gulab jamun, barfi, and other items are prepared. The believers visit each others homes and consolidate their bonds of relationship. The Muslims of Indian sub-continent celebrate this day irrespective of their sects. Lately, the Wahhabis tried to sow discord among Muslims (as per their agenda) and tried abstain them from holding such festivities by calling falsely to it as bid-at and haraam. The reasons you have written for 22nd rajab is not historical and significance of this day. The fact is that the Muaviyah the son of Abu Sufiyan died on this day. He was the enemy of Ali and fought battles against him, the "Khalifa-e-Raashid" of the time. Muaviyah rebelled against the Islamic government which was elected by the people. The breach of allegiance of Ali, Muaviyah committed seditious act. Later, his son Yazid proved the unjust stand of his father and grandfather. Indeed, the 22nd Rajab should be a day to celebrate. Qutubuddin is correct ... thts the fact.... pls check the facts before writing them!!! The reason for this celebration is NOT the death of Mu'awiyah (LA). It is a follow-on tradition from a miracle that occurred in Madina, where a poor woman was to cook for guests invited by her husband, but she did not have enough food. So she asked Allah swt in the name of Imam Ja'far As-Sadiq (AS) to protect her dignity and not let the food be too less. By the Waseelah of the Imam (AS), she said "Bismillah" before she started cooking, and the miracle is that the food did not become any less in the pot, in fact, there were more guests than expected, and all of them ate heartily, before leaving their hosts with much praise for the food and the hospitality offered by their humble hosts. This is why we do this Niyaz. 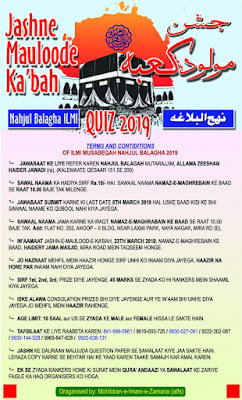 That Mu'awiyah (LA) died on this date at another time has nothing to do with this festival.